Good morning! We awoke to about 6-8 inches of new snow and before anyone felt like shoveling a proper breakfast was required! 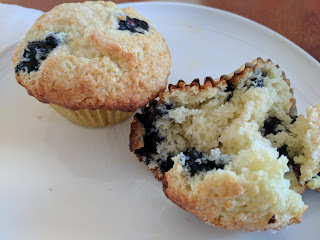 I pulled out my school cookbook and found a recipe for berry muffins. I had to cut the recipe in half, or I would have ended up with 32 muffins! This also gave me an opportunity to use my new scoops so I could distribute the batter evenly amongst the muffin cups. The tops were sprinkled with sanding sugar, yum! Yesterday during the snowstorm I went to a friend's house to teach her how to make macarons. What I found was that, even with her newer and better functioning oven, they still didn't do the right thing. I'm not sure where to go from here, but I've been eyeing professional grade convection ovens for my kitchen and I might just have to go that route.